Start off with a simple cake mix and wind up with an amazing chocolate rum cake recipe! Who'd think that is was this easy? No kidding, we've researched this one. If you've got a cake mix, a box of Jello pudding and a bottle of rum in your pantry...well, you're half way there to making a delicious and easy chocolate cake recipe. This is one dessert cake you won't want to miss out on. Once you've taste tested it, let us know how this chocolate rum cake recipe worked out for you or if you'd like one of your favorite recipes featured on our site, please drop us a line.! 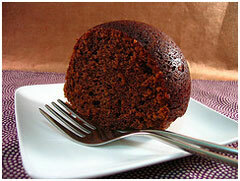 A big "THANKS" goes out to Virtual Frolic for the chocolate rum cake photo. Check out his/her blog for more amazing ideas and pictures. Start a Cookbook Collection Today! I'm an avid cookbook collector. Ever since I discovered Amazon.com, it's become easier and easier to buy books, without getting in my car! (and at these gas prices....you know what I'm talking about!) 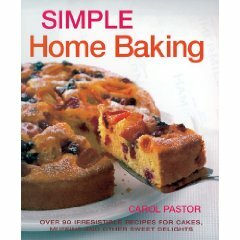 When I see a book that I want, like Simple Home Baking , I just click away and make my purchase. Amazon delivers it straight to my door. It's that easy! So treat yourself or buy a gift for your favorite chef by clicking here to purchase Simple Home Baking . 1. Preheat oven to 350° F (180° C). 2. Grease and flour two 9-inch layer cake pans. 4. Pour into prepared pans. Bake for 30 minutes or until the cake tests done. Do Not Over Mix! 5. Cool in pans for 10 minutes, then remove from pans and finish cooling on baking racks. 1. Combine milk, rum, pudding mix and topping mix in a deep bowl. 2. Blend well at high speed for 4 minutes, uintil light and fluffy. 1. Split the cake layers horizontally. 2. Spread one cup of the filling between each layer and over the top of the cake. 3. Keep this cake well chilled and serve cold.